Remember 46M, the puma that wandered into downtown Mountain View a few months ago? Well he had quite a journey for the last 5 months until he was hit by a car on Hwy 280 a few days ago. After capturing him in downtown Mt. View and releasing him back in the mountains from where he came, he resumed his northward trek until he hit Pacifica and Milagra ridge and couldn’t head north anymore without hitting a sea of development. Then he turned around and headed south hugging highway 280 to his east until he found what appears to be an underpass that led him into a patch of fertile ground on either side of Crystal Springs road just to the east of 280. He stayed in this roughly 1 square km area for at least 2 weeks feeding on what appears to be an abundant deer population there. He then headed north again to Pacifica, before backtracking south again to the hills east of 280 near San Carlos. He stayed there for a number of days making a living killing deer in the small patches of open space that remain in this highly developed area. Finally he tried to cross 280 again but was not so fortunate this time around. A number of observations strike me in looking at his track. 1 – This is completely normal behavior for a dispersing (i.e. young animals that are looking for a new home) mountain lion. Notice that he is often on the edge of open space. This is a pattern we have observed before with other dispersing animals. Most likely they are either avoiding more dominant animals that currently occupy those territories, and/or they are looking for a way to cross a barrier (such as 280). 2 – Mountain lions are very shy. This guy was a stone’s throw away from people’s houses for much of the last 5 months, and yet we are not aware of any conflicts between him and people or even of any reported sightings of him. 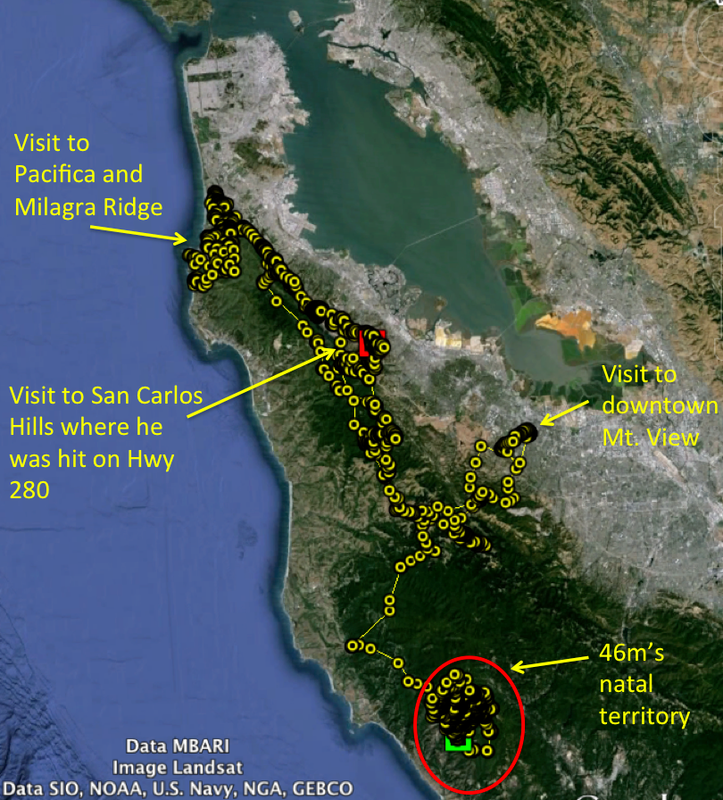 In fact, all the areas that he explored probably have regular visits by adult mountain lions that have territories covering those areas. 3 – The way he died is avoidable. Each year millions of animals ranging in size from salamanders to mountain lions are killed on roadways. A lot of these deaths occur because there are no viable options for animals to cross roads that don’t involve crossing asphalt. In many places, roads are the leading cause of death and population decline of our wild animals. But we could install wildlife crossing structures, such as underpasses or overpasses, when designing and retrofitting roads. Denmark, a country not much bigger than the Bay Area, has over 200 such wildlife crossing structures. Why not here? I think it is largely that people simply aren’t aware that this is such a huge problem. So spread the word!